Nigel Slater adds his twist to the classic coffee and walnut combination. 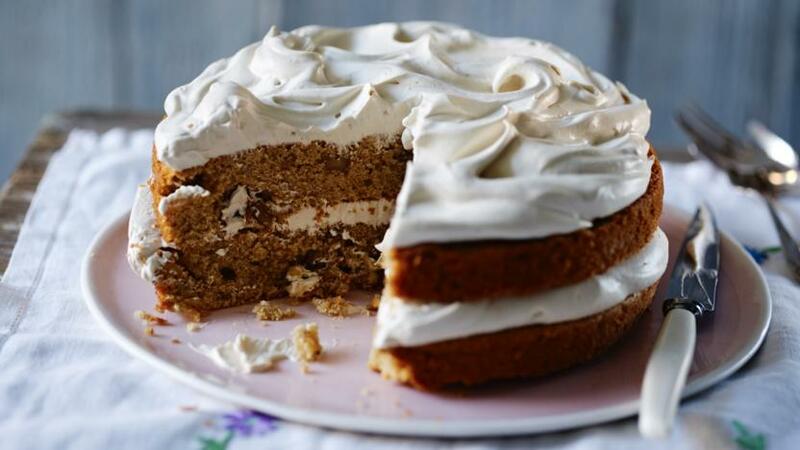 The coffee-flavoured cream filling is a sublime alternative to the usual buttercream. Line the base of two 20cm (8in) loose-bottomed sponge tins with baking parchment. Beat the butter and caster sugar until light, pale and fluffy. You could do this by hand, but it is far easier with an electric mixer. Crack the eggs into a bowl, break them up with a fork, then add them a little at a time to the butter and sugar, beating well after each addition. Combine the flour and baking powder and gently mix into the butter and sugar, either with a hand-mixer on a slow speed or by hand, with a large metal spoon. Dissolve the coffee granules in a tablespoon of boiling water, then stir into the mixture. Divide the cake mixture between the two tins, smooth the top lightly and bake for 20 to 25 minutes - the cake should be springy to the touch and a skewer inserted inside should come out clean. For the topping and filling, whip the double cream and add the coffee mixture. Spread half the coffee cream over one of the cake halves and sandwich the cakes together. Smooth the remaining coffee cream over the top.